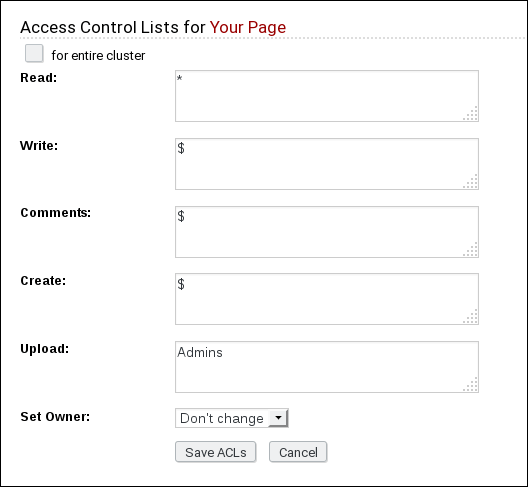 Every page has five access control lists (ACLs), read, write, comment, create and upload, which can be modified by the page owner (usually the user who created the page). read defines who is allowed to view the page, write defines who is allowed to edit it, and comment defines who is allowed to attach comments. All ACLs are plain text lists containing a number of user names or the * placeholder representing "everyone". Entries can be inverted by appending them with an exclamation mark. For example, while * means "everybody has access", ! * means "nobody has access". The exclamation mark modifier works with user names, too, of course. An empty list implies "nobody has access". For example, if the write ACL only contains the line SomeGuy, only the SomeGuy user has access, but no one else. If it contains a line with * and another line with !SomeGuy, it means everybody has access except SomeGuy. The read, write, comment, create and upload ACLs are available for every page on the site; Custom PageHandlers can introduce extra ACLs as needed. In WackoWiki you can edit the ACL for every page. Access rights are inherited. In other words, if you create a new page below an existing (i.e. a child page), this new page will have the same access rights as the parent document for it. Inheritance happens when you create a page, and in consequence the rights of the child or the parent documents can be changed without detriment to each other. One exception to the inheritance rules is the right to edit the document, which is inherited from the ACL on the creation of sub-pages. That is, for example, if you create sub-pages below this can only Boris and Anna, then, by creating sub-pages, only they will be able to edit it. Since R5 groups can be administered via the Admin panel. WackoWiki supports groups of users (aliases). Only site administrator can create and edit aliases. This will create alias Admins with one member RomanIvanov and alias Workgroup with RomanIvanov & AlekseyKulakov members. Names of aliases are case independent. Alias Admins is special. All of its members are admins, and, for example, can delete or rename any page. After installing the default value for every action is set to * – all users (even unregistered users) have access. Note: Changing the defaults will only affect new created pages! Pages which were created before changing the defaults will keep there original ACL!.